version 1.5.2 January 2017 See version info. Droneo 1.5.2 is now available in the App Store. This version has Audiobus / IAA support! This will let you use Droneo's audio as a source in a chain of other audio effects! With Audiobus and IAA, you can record, edit and effect your Droneo Drones better than ever! Click here to get the Droneo 1.5.2 instructions as a PDF. If you are ON an iDevice right now, you can then save it to iBooks for convenient reading. Here's an essay about Droneo 1.5 and its uses and some theory you can practice with it! And here is A good review of Droneo 1.5+ by Warren Burt in SoundBytes magazine. Here are a few Droneo voices you can import You can also export your Droneo voices here so others can use them. Questions about Droneo? Email me! Using Droneo in your work? Tell me about it! I'd like credit, but I kind of see Droneo as a tool for tapping into a vast river of sound that cannot be owned; it would be like claiming ownership of a mote of dust. Droneo 1.5 Demo from JHH Lowengard on Vimeo. 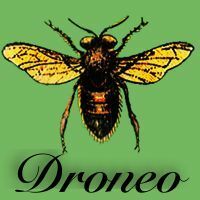 • MP3: Listen to how to build one kind of complex drone with Droneo! In this example, an evolving drone's base frequency is dropped a few times.